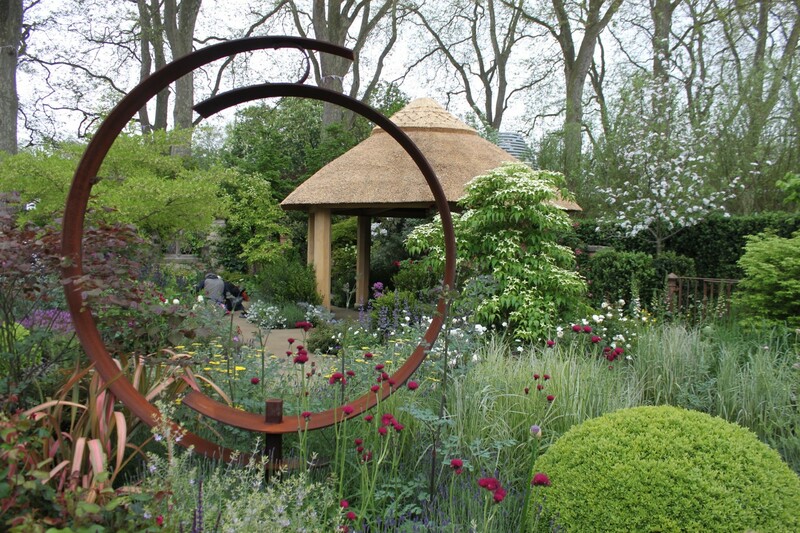 For one hundred years the RHS Chelsea Flower Show has been bringing the best garden in garden design and horticultural excellence to the world stage. Every year designers have been pushing the envelope to create truly amazing gardens and show off just what is possible in a garden, and this centenary year has proven no exception. Expectations were wary this time round with a long winter and hard weather adding increasing obstacles for designers and growers alike, but in spite of the difficulties this centenary year has seen the largest numbers of gold medals awarded since the show started in 1913. So to celebrate all that ingenuity and gardening gusto we’ve selected some of the best gold winning large gardens we saw at the show. Designed my Roger Platts this classically designed garden bridged the gap with the gardens of the very first Chelsea in 1913. A nurseryman by trade, Platts brought together a wealth of plants, all grown and prepared by the man himself, despite the cold weather to bring us his classic British garden. 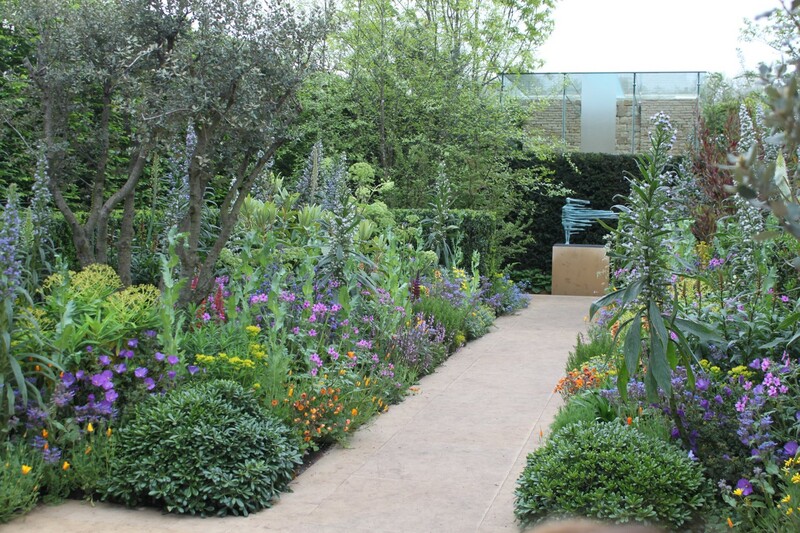 Focusing on herbaceous plants, this garden would evoke a sense of nostalgia in any Chelsea enthusiast. Roses and delphiniums in particular add colour and scent, all arranged in a classic structure around a round oak summer house that provides a civilised seating area for a spot of tea. A gorgeous garden as it is, it’s a shame the cold weather meant Roger’s prized euphorbia didn’t quite make it to flower in time for the show. Still a happy reminder of the past and a worthy gold. My personal favourite, but after a controversial ruling left designer Robert Myers with only a silver gilt back in 2011, many thought he wouldn’t be seen at Chelsea for a while. Thankfully he was back this year with his homage to native plants. This contemporary garden uses clean lines and crafted hedging to bring a pleasing texture to the garden landscape. Pleached hedges and rowan trees add that wonderfully home grown feel to the and boxed hedges bring a surprising quirk are the Myers’ ‘pillow mounds’. Though disaster nearly struck for the hedging due to frost damage over a harsh winter, Myer’s cut them back into the rounded puffs of greenery that give this stylish and modern garden just a hint of softness. Last year’s games may be over and the Olympic Village little more than a block of flats, but designers Marie Louise Aguis and Michael Balston held on to a little of that sporting spirit with their modern garden inspired by the Queen Elizabeth Olympic Park. A showcase of curves, the designers went out of their way to demonstrate how to bring organic shapes and soft structure into a small garden. 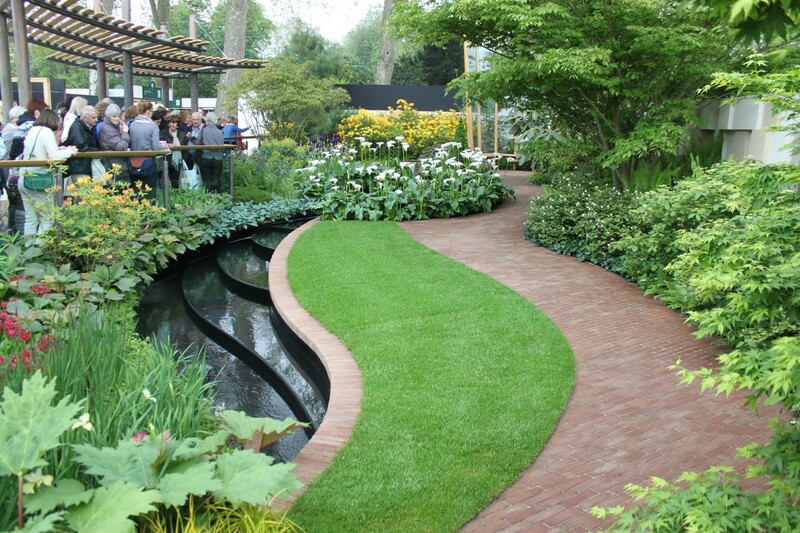 The garden itself is dominated by curving stream that flows the length of the garden, parallel to an equally curvy path, made out of small paving slabs so as to achieve its lithe shape even in such a limited space. Wooden seating areas and sculptural fencing, also in the same curvaceous style, bring a warm and inviting element to the space, while the planting is arranged to add a relaxing and rejuvenating energy to the garden as a whole. 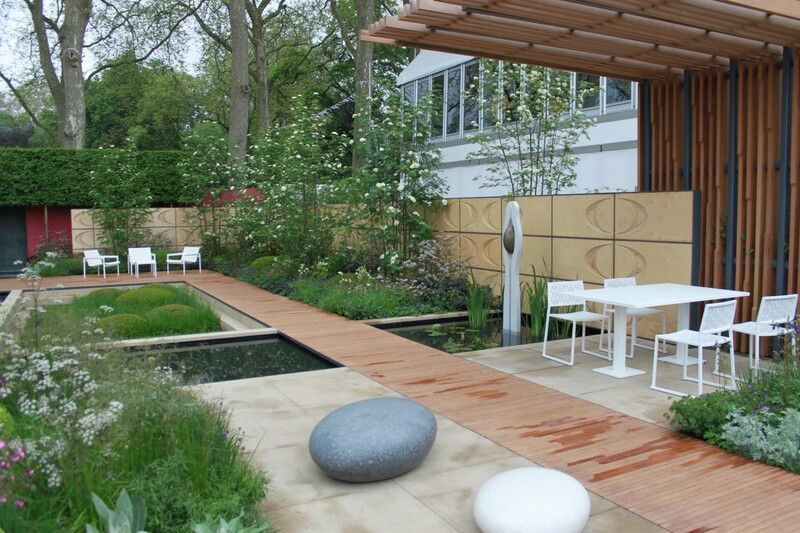 Winning the People Award, this is a very personal and emotional garden for Designer Chris Beardshaw. Having suffered for years from arthritis himself, there was a lot of that journey built into the design. Based on three stages of the journey a sufferer experiences, the garden starts in the shady Veiled Garden representing the ‘fog’ of pain. It then travels to the Lucid Garden. The geometrical form of this part of the garden represents the experience of the sufferer as they realise life can be fulfilling. The last part of the design is the Radiant Garden, exploding with vibrant colours. This represents the sense of liberation as the sufferer learns to manage the condition. The planting in the garden overall and in the Radiant Garden in particular is stunning, as are the three sculptures he has selected. ‘Homage’ by Anna Gillespie is located in the Veiled Garden. A beautiful sculpture in bronze in human form in a crouching pose. ‘To The Limit’ also by Anna Gillespie is in grey bronze and although located in the Lucid Garden can be seen from the end of the Radiant Garden where Michelle Castles’ ‘Libertine’ dominates the viewers first views of the garden depicting freedom and joy. The design is brilliant and a worthy winner of both the Gold Medal and the People’s award.